Lost Sectors are hidden within every open map area in Destiny 2, but there are some in the European Dead Zone that are particularly difficult to uncover. In this Destiny 2 Drain Lost Sector guide, we'll be pinpointing the location of one said Lost Sector, so you can track it down as easily as possible. If you instead need help on the wider game of Destiny, you'll want to head over to our Destiny 2 guides hub. It's here that you can find complete walkthrough guides on how to obtain some of the more elusive Exotic weapons in the game, including the Rat King and the MIDA Multi-Tool, as well as how to complete the Leviathan Raid. If you don't already know, Lost Sectors are unmarked treasure caves on the Destiny 2 map. They're on every single map in the game, from Mars to Earth, and they always marked on your map by the same symbol: an upside down semi circle with a dot in the middle. Whenever you see one of these markers on your map, it means that a Lost Sector is nearby. However, some Lost Sectors are significantly harder to find, as is the case with The Drain. To find this Lost Sector in particular, you'll need to head to the European Dead Zone on Earth, and into the Outskirts area. 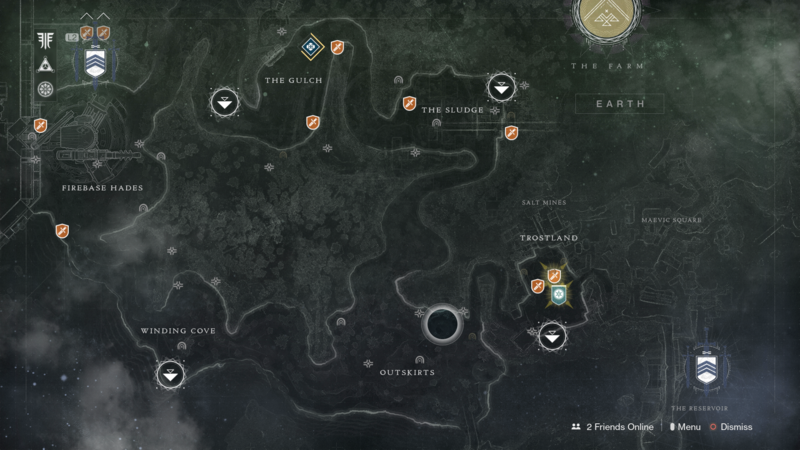 You need to be in the northern section of the area, in the exact same location as our cursor is in the map screenshot from Destiny 2 just below. Once you're into The Drain, you're going to be battling through hordes of Fallen enemies. There's Dregs, Vandals, and Shanks aplenty in this mini dungeon, so we'd recommend packing rapid fire weapons for your venture into this Lost Sector. Now that we're all done with this Destiny 2 guide, you can continue ahead to our additional guides on the game. Why not check out our Destiny 2 Gambit guide, where we'll break down exactly how you can dominate the online competition in the new mode.